I enjoy running workshops for both adults and children in galleries, schools, and other venues. I also run mini workshops for childrens parties, the Womens Institute, Hen parties etc. I will travel to a venue of your choice and bring everything needed. The workshops are varied and are designed to encourage creativity. Clay is an amazing material and the scope for creative ideas is huge! There are a number of workshops I run already but am always open to new ideas and am happy to work to specific requests. For up to 12 children. The workshop lasts an hour. The children have fun making something from clay and sometimes using colours to paint it. The finished work is returned three weeks after the party. Something really special to keep and remember the party by!! This is a lovely way to spend an hour with your friends and relatives, making something special as a keepsake. Each person makes a little heart dish and paints it with pretty colours. An extra little heart is made by each person that is made up into a heart wreath for the bride-to-be to keep. The hearts will be lustred to add extra sparkle! 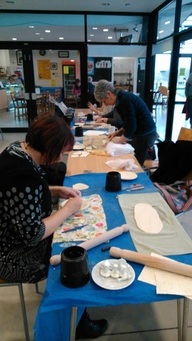 Adult workshops £20.00 to£40.00 per person. These are workshops suitable for any group of adults either in a gallery, night school or private party as well as workshops arranged and run by myself. The workshop is at least two hours - usually longer, making a plaque or sculpted piece of ceramic art eg. Greenman plaque, moon gazing hare etc. A great way to relax and create something special. Work is processed and returned three weeks after the workshop. A talk about studio pottery and my own work plus a short clay activity - something different and fun for your monthly meeting!! The talk and activity take around an hour. Finished items are returned in time for the next months meeting. These are only a few examples but hopefully give an idea of the possibilities! Check out the Workshop Dates for up to date lists of workshops but also for ideas of the kind of things we make. If you would like to book me for a workshop, private group, WI meeting or childrens birthday party please contact me. I am DBS Registered and have all relevant documents including Insurance cover for workshop activities.